Try a FREE martial arts taster class - children or adults. of which are so important in today's modern world. It is a systematic study of all of the traditional fighting arts, which together comprise the martial arts history of Korea. 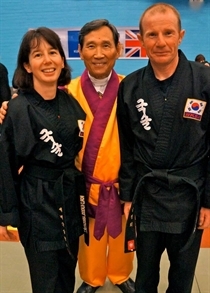 As a martial arts system, Kuk Sool Won™ is exteremely well-organised; and seeks to integrate and explore the entire spectrum of established Asian fighting arts and body conditioning techniques, as well as mental development and traditional weapons training. Our instructors have a combined experience of over 20 years in the industry - practising and teaching. Our classes are suitable for all ages and abilities and will be enjoyed by all - male, female, young and old. We aim to provide our students with an encouraging environment to help improve their mental, physical and emotional well-being. Kuk Sool Won™ is focussed on self-defence, discipline and respect, as well as incorporating many other aspects of the martial arts. We also offer free on-site parking.